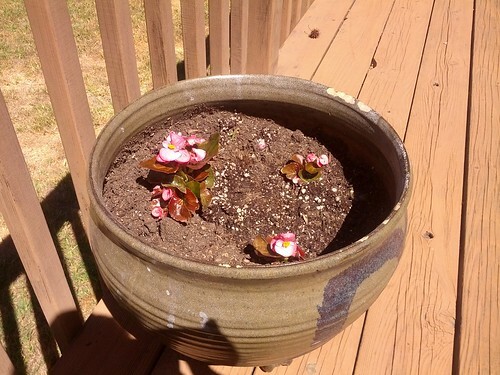 I've had a few indoor potted plants in my life (which survived as long as they were kept well out of reach of the cats), but never really flowers, and certainly nothing outdoors. Also, being from the midwest, I don't yet quite understand what the deal is here with weather and seasons, or the lack thereof. So, when it comes to planting flowers, outside, in California, I Have No Idea What I'm Doing.™ Nevertheless, I've attempted it! Here are the results so far! These are impatiens! 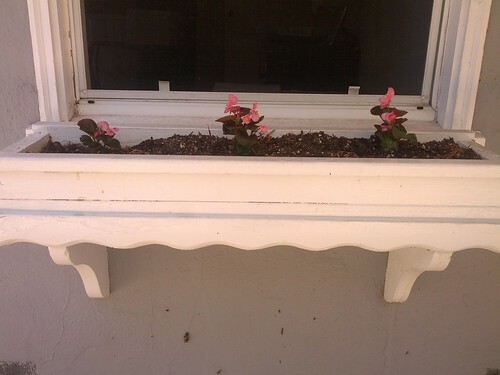 I got twelve of 'em to go in this window box, but that turned out to be too many (they're supposed to be ten inches apart, I guess), so three of them ended up in the pot to the right (which was already sitting there with dirt in it), and I put two more in another stray pot I found. They like shade, which is why I put them here; this area never gets direct sunlight, since it's under an awning (which you can kind of see reflected in the window). ...I put the three extra plants in this other pot, which was yet another stray pot I just found lying by the side of the house! It's actually a very nice pot, and I was happy to be able to put it to good use. It's on our awesome back deck, which we haven't really used to its full advantage yet, since we have no deck furniture. One thing at a time. Taken together, the flowers (twelve impatiens plants, six begonias, two big chrysanthemums), potting soil, gardening gloves, and a couple gardening tools cost, like, $60. I didn't have to buy any pots, since they were all already sitting around outside somewhere, and I didn't even use most of the potting soil, since the window boxes and most of the pots already had soil in them that really just seemed to need a good loosening and watering. And the gloves and tools are one-time expenses. So, next time I want to plant something, I can just go get the plants -- or maybe even seeds, if I'm adventurous. I can't take any credit for how the rest of the yard looks; it's taken care of by a professional gardener as part of the rental agreement.1 At our old place in Bloomington, the yard had some nice trees and some lovely perennial flowers, mostly daffodils and tiger lilies, which were great because they'd just grow every year without us having to do anything. But for the most part, it was kind of out of control. Once in a great while, our previous landlord would send someone over to try to tame it. They'd make a valiant effort, and it would look nice for a short time, but it would soon be back to its overgrown state. Oh, and the fence in the back yard had fallen down rather dramatically, and no one had bothered to get it fixed.2 So it's refreshing to have such a well-kept yard at our new place; it makes me actually want to put effort into things like these pots and window boxes, whereas before it would've seemed futile. 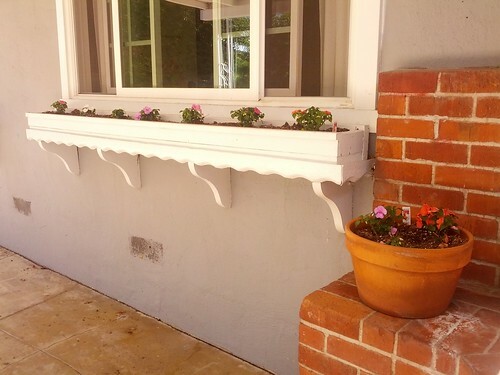 Also, I've never lived in a place that had window boxes before, and it strikes me as a totally sweet hack: you can be inside and be right next to the plants (albeit on the other side of a screen), and yet your cats can't get at them! The window with the begonias is particularly nice, since it's right next to my desk and always open, so it's almost like there are flowers on my desk all the time. And now we'll see if I can keep 'em all alive. Updates as warranted. This is strange for me. Where I grew up, I'm pretty sure people take care of their own damn yards; either that, or they just don't bother. I think the gardener has actually been here every week since we moved in, with the exception of one week, and I don't actually understand what they're finding to do, since to me the yard always looks great! Also, we have a freakin' sprinkler system, like the bougie suburbanites that we apparently now are. 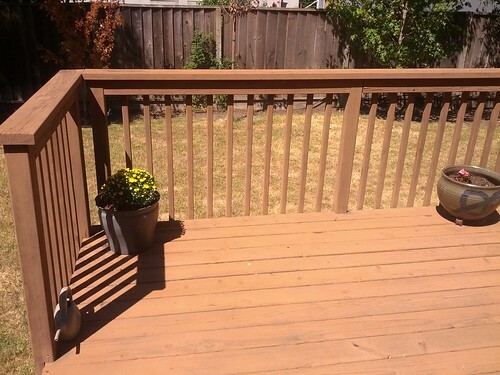 I think it's disconnected, on account of we're in the middle of an extreme drought (and on account of I've never seen or heard it operating), but I don't really understand the deal with sprinkler systems, either. California, man. At one point, said previous landlord sent someone to fix the fence. The guy came over; stood there, toolbox in hand, looking at the busted fence for a couple of minutes; and then just walked away, defeated.